MISSION, KS--(Marketwire - October 11, 2010) - (Family Features) Putting wholesome food on the table that your family will enjoy doesn't have to take hours to prepare. Registered Dietitian and author, Felicia Stoler, offers some simple recipes and tips on how to add more flavor and nutrition into your meals, making meal prep stress-free and fun for the family. Keep your pantry stocked and plan ahead. A pasta meal typically takes less than thirty minutes to make. Ragú® Old World Style® Traditional pasta sauce now has a new, thicker recipe with two servings of vegetables in every half cup. Add some pre-cut fresh, frozen or canned greens as a side dish, and you have a veggie-packed meal. Include your kids in the cooking process. This is a great way to spend quality time with your children and teach them the skill of cooking. They love to feel like they can contribute to their family, plus -- many kids will eat what they make. Use leftovers for lunch. 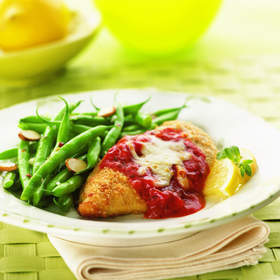 The Ragú® No Frying Chicken Parmesan is a classic dish that will help you save time. After dinnertime, pack it in a small container or prepare in a hero sandwich for lunch the next day to make less work (and stress) for you in the morning. Try these recipes with the new Ragú® Old World Style® Traditional pasta sauce, available in the pasta sauce aisle nationwide. For more tips and delicious recipes, visit www.ragu.com or www.facebook.com/ragusauce. Brown ground beef in 12-inch skillet; drain. Stir in Pasta Sauce and water. Bring to a boil over high heat. Stir in uncooked rotini and return to a boil. Reduce heat to medium and cook covered, stirring occasionally, 14 minutes or until rotini is tender. Remove from heat, then sprinkle with cheese. Cover and let stand 5 minutes or until cheese is melted. Combine ground beef, bread, eggs, 1/2 cup Pasta Sauce, Italian seasoning and garlic powder in medium bowl; shape into 18 meatballs. Bring remaining Pasta Sauce to a boil over medium-high heat in 12-inch skillet. Gently stir in uncooked meatballs. Reduce heat to low and simmer covered, stirring occasionally, 20 minutes or until meatballs are done. Serve over hot spaghetti. TIP: Try adding a cube of mozzarella cheese to the center of each meatball for an easy but fun recipe twist.